Central clearing - a key element in the reform agenda for over-the-counter (OTC) derivatives markets aimed at reducing systemic risks - made further inroads in the second half of 2016. 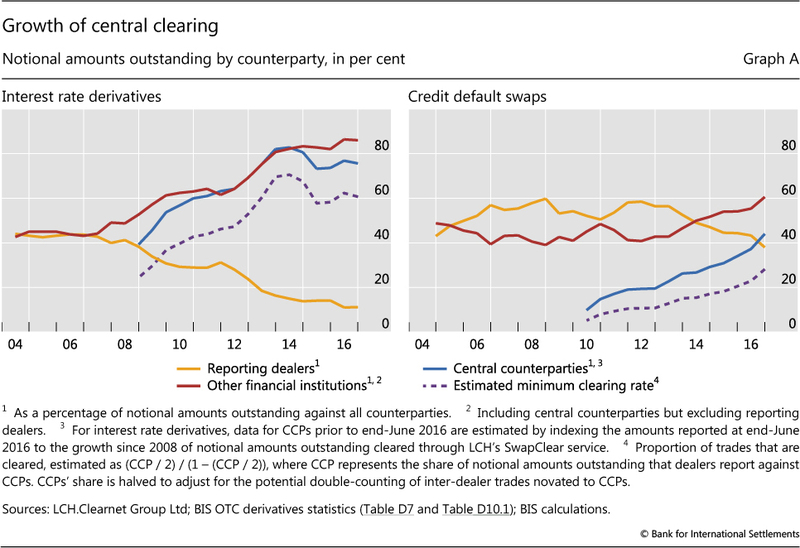 When, at end-June 2016, the BIS collected comprehensive data on central counterparties (CCPs) for the first time, the numbers showed that central clearing was predominant in OTC interest rate derivatives markets but less prevalent in other OTC derivatives segments. Data at end-December 2016 indicate that central clearing is gaining in importance in these other segments too. In OTC interest rate derivatives markets, the share of outstanding contracts centrally cleared through CCPs stood at 76% of notional amounts outstanding at end-December 2016, similar to the share observed six months earlier (Graph A, left-hand panel). If this share is adjusted to approximate the proportion of trades - as opposed to outstanding positions - that are cleared through CCPs, then the estimated minimum clearing rate was 61%. The share of outstanding positions booked against CCPs was highest for forward rate agreements, at 92%, followed by interest rate swaps, at 81%. It remained less than 1% for interest rate options, although the outstanding amount of option contracts reported against CCPs quadrupled in the second half of 2016, from $53 billion to $225 billion. In credit default swap (CDS) markets, the share centrally cleared jumped from 37% of notional amounts outstanding at end-June 2016 to 44% at end-December 2016. This movement represented the largest semiannual increase in the centrally cleared share since CCP data for CDS were first collected in 2010 (Graph A, right-hand panel). It corresponds to an increase in the estimated minimum clearing rate from 23% to 28% in the second half of 2016. The proportion of outstanding CDS contracts centrally cleared increased for single-name as well as multi-name instruments, although the proportion remained much higher for the latter: 54% compared with 36%. Multi-name products tend to be more standardised than single-name products and consequently more amenable to central clearing. Notably, the increase in the proportion was driven by a sharp decline in the uncleared segment of CDS markets. Whereas the notional amount cleared through CCPs was more or less unchanged in the second half of 2016, at $4.3 trillion, the notional amount for contracts between reporting dealers fell from $5.1 trillion to $3.7 trillion. In OTC foreign exchange derivatives markets, only 1% of notional amounts were centrally cleared at end-December 2016. That said, the outstanding amount cleared almost tripled in the second half of 2016, from $352 billion to $903 billion. While the BIS data do not break down FX derivatives into FX swaps and forwards, the growth of clearing was probably concentrated in non-deliverable forwards because they are commonly offered for clearing, whereas this is not the case for other FX instruments. The rising importance of central clearing in OTC derivatives markets is consistent with the incentives provided by higher capital and margin requirements for non-centrally cleared derivatives. Regulators in most of the major derivatives markets require certain classes of standardised OTC derivatives, particularly interest rate swaps and CDS, to be centrally cleared. While options, FX derivatives and equity derivatives are generally not covered by these requirements, higher margin requirements for non-centrally cleared derivatives are being phased in, starting in Canada, Japan and the United States in September 2016 and in other key markets in 2017. The proportion of outstanding positions against CCPs is typically larger than the proportion of trades cleared through CCPs - known as the clearing rate - because the former counts trades between dealers twice. In the BIS OTC derivatives statistics, whereas inter-dealer positions are adjusted to eliminate double-counting, inter-dealer trades that are subsequently novated to a CCP are not adjusted. When a derivatives trade is cleared by a CCP, the initial contract between counterparties A and B is replaced, in an operation called novation, by two new contracts: one between counterparty A and the CCP, and a second between the CCP and counterparty B. Under the extreme assumption that all positions with CCPs are initially inter-dealer contracts, positions with CCPs could be adjusted by dividing by two. The actual clearing rate is likely to be higher than this minimum estimate because some positions with CCPs may initially be trades with institutional investors and other financial customers, which in the BIS OTC derivatives statistics are not double-counted when novated to CCPs. 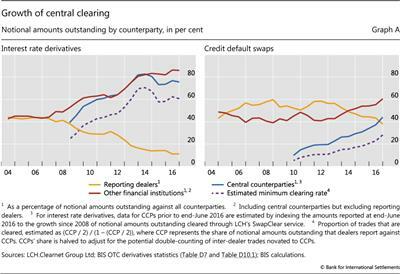 For further discussion, see P Wooldridge, "Central clearing predominates in OTC interest rate derivatives markets", BIS Quarterly Review, December 2016, pp 22-24. See Financial Stability Board, "OTC derivatives market reforms: eleventh progress report on implementation", August 2016.